For the first time in Switzerland’s 113-year chess history, a woman has been able to win both the women’s and men’s national chess titles. 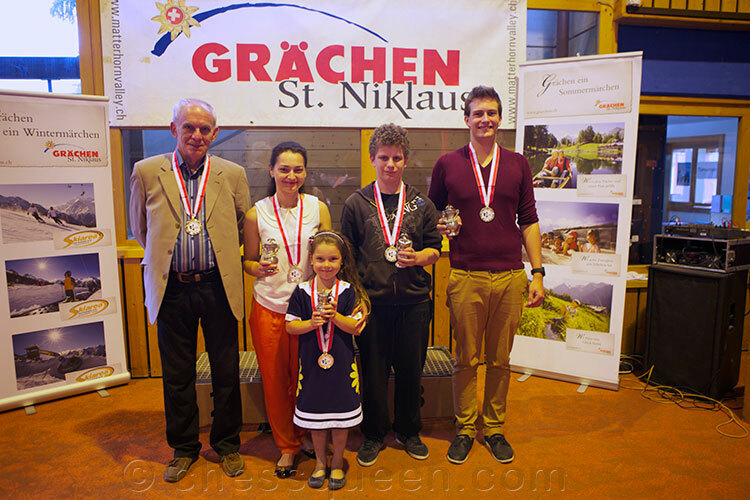 Chess Queen™ Alexandra Kosteniuk has conquered the top step on both podiums last week in Grächen, Switzerland. Thanks to her dual Swiss-Russian citizenship, Alexandra Kosteniuk has been invited to fight for the National Swiss Championship for the 5th year in a row. The last 4 years she was close to the top but not quite first, the winners last years have been Grandmasters Viktor Kortchnoi (2009 and 2011), Yannick Pelletier (2010), and Joe Gallagher (2012). This year’s Swiss championship took place in the beautiful mountain resort Grächen (close to Zermatt). The event started with 8 GM’s and 8 IM’s, the strongest being GM’s Bauer, Stojanovic, Sokolov and Miezis, and the highest ranked fighting for the Swiss title were Gallagher, Kosteniuk, Gerber, Lötscher, Buss, Klauser and Carron. The last round was critical, Alexandra drew GM Bauer (Elo 2637) and got 6.5/9: But IM Buss and GM Gallagher also finished with 6.5/9, so according to the rules of the championship the top 2 players according to Bukhholz had to play a tie-break match of 2 games. Alexandra won both games against IM Buss and became the first woman to win the men’s Swiss Championship. You can find lots of more photos, game and reports at Chess Queen Alexandra Kosteniuk's personal blog at www.chessqueen.com.